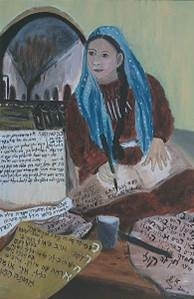 “Bat Yosef – Daughter of Joseph”, hinting at the biblical name of the Jewish people “House of Joseph”. This is a unique, feminine personification of a people that longs to return to its land, and over the years the nickname “Bat Yosef” became her nom de plume. Because of unblemished Abraham’s merit. Who at morning time hears my voice. For they are Your people and Your inheritance. To the mountains of my homeland. And give support to my cause. My rock and my rescuer. Lot and guardian of my fate. Every sin of mine forgive. My Rock, strengthen my community. and I will offer my burnt incense. Among many I praise Him. May he raise His banner among our tents. Make Your kindness toward us be abundant. And may this, my voice, be received with favor. את הפיוט 'פנה אלינו ברחמים' חיברה המלומדת והפייטנית פריחא בת אברהם בר אדיבה (מרוקו ותוניס במאה השמונה־עשרה), ששמה ושם אבותיה מופיעים באקרוסטיכון. בפיוט מְתַנָּה המשוררת את מועקת הגולה ואת התקווה לקיבוץ הגלויות ולגאולה.